The Adirondack Thunder has clinched a berth in the 2018 Kelly Cup Playoffs of the ECHL. It is the third season in a row the Glens Falls-based team has played their way into the post season. The Adirondack Thunder have clinched a 2018 Kelly Cup playoff berth. The Thunder has now reached the postseason in each of its three seasons as members of the ECHL. The team will take on the Worcester Railers in Round 1, courtesy of the Thunder finishing first in the North Division and Worcester finishing in fourth. 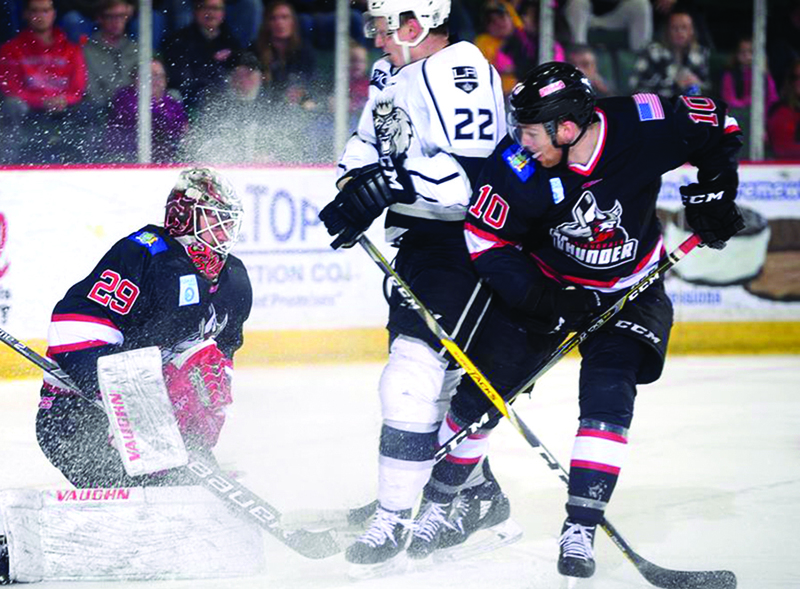 The Thunder and Railers will play a best of seven series in a 1-2-2-1-1 format, beginning with Game 1 at Cool Insuring Arena on Friday, April 13 at 7 p.m. The series will then shift to the DCU Center in Worcester for Games 2 and 3, to be played on Saturday, April 14 and Sunday April 15 at 5:05 p.m.
Glens Falls will receive $750,000 from the state for the demolition of 49 and 51-57 South St., a project that will be followed by the construction of a 10,000-square-foot Farmers Market Food Hub that is part of the downtown revitalization going on in the city. Funds will also assist with the environmental remediation and rehabilitation of two adjacent buildings in preparation for proposed adaptive mixed-use developments. The funds are part of more than $11 million that was awarded in March to 10 Capital Region municipalities through Round 5 of the Restore New York Communities Initiative. “This $750,000 fund will permit further work along South Street and will supplement the DRI award,” said EDC Warren County President Ed Bartholomew said. 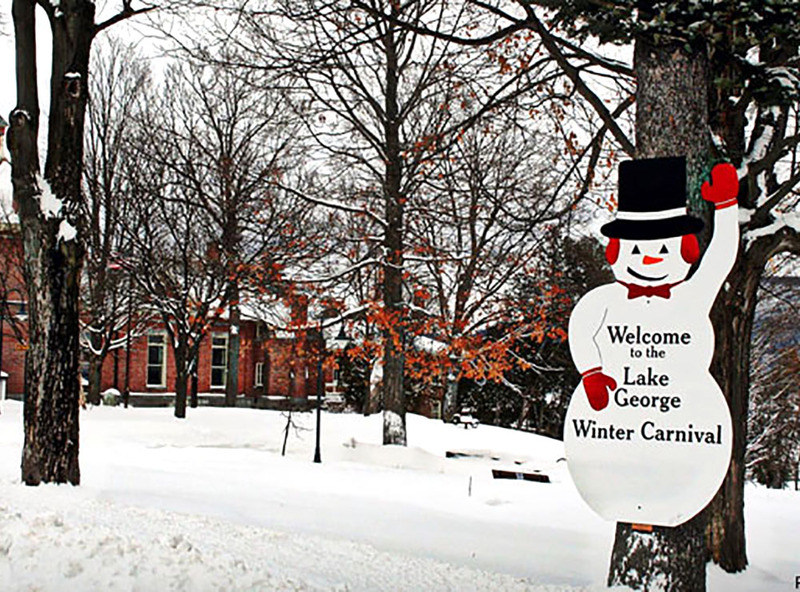 The Lake George Winter Carnival is held on weekends each February. The 57th Lake George Winter Carnival was one of the best ever for the village, according to Lou Tokos, co-chairman of the event. The month-long celebration of winter took place each weekend in February and is one of the attractions that brings people to the area in the “off season” away from the summer months when people flock to enjoy the lake. Lake George is hoping to expand tourism and become a year-round destination. “The carnival is the engine that fuels the economy during the harsh winter months. Souvenir shops open, restaurants fill up, and the hotels are booked. We have a great crew of people who work tirelessly to make this happen,” said Tokos. Gina Mintzer receives a plaque at the MAAC basketball championship in Albany. 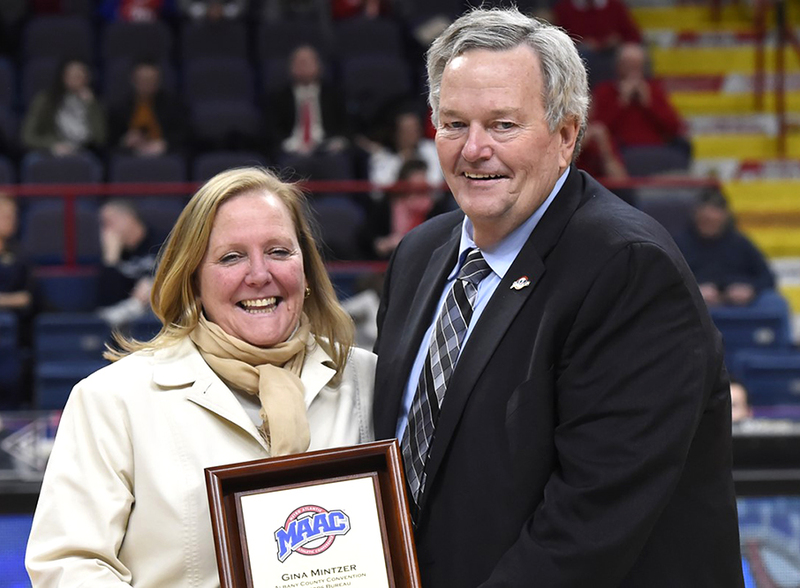 Gina Mintzer, executive director of the Lake George Regional Chamber of Commerce, was recently honored during the Metro Atlantic Athletic Conference (MAAC) basketball championships at the Times Union Center in Albany. Mintzer worked on MAAC and NCAA events from 2000 to 2017 during her tenure as the director of sales for the Albany County Convention & Visitors Bureau. 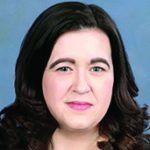 Mintzer, who lives in Queensbury, began her position at the Chamber in September. Glens Falls National Bank and Trust Co. has announced the promotions of the following individuals: Megan Bohan to assistant vice president and Jenine Macura to vice president. Bohan is the branch manager for the Glens Falls National main office. In this role, she interacts with multiple lines of business and oversees branch operations. She joined the company in 2002 as a teller. She became branch manager in 2016. Bohan serves as treasurer of the Adirondack Samaritan Counseling Center board of directors. Macura is currently the branch manager for the Granville office. She started with the company in 2012. 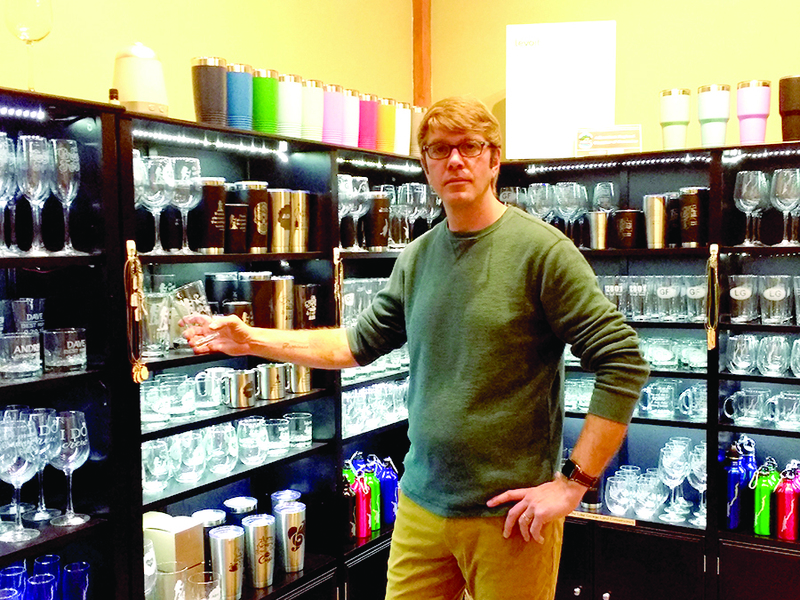 Larry Gonyea is the owner of Adirondack Etching, located at The Shirt Factory in Glens Falls, does custom etching on all kinds of glassware with all kinds of regional themes. Larry Gonyea traded in a desk job for selling etched glass gifts at his new shop, Adirondack Etching, located at The Shirt Factory. Most gifts were hand-made wood items. Gonyea is a self-described “second generation wood turner,” learning the craft from his father. Woodturning is the art and craft of creating shaped objects on a lathe. “My father is very good, and I picked up skills from him,” he said. 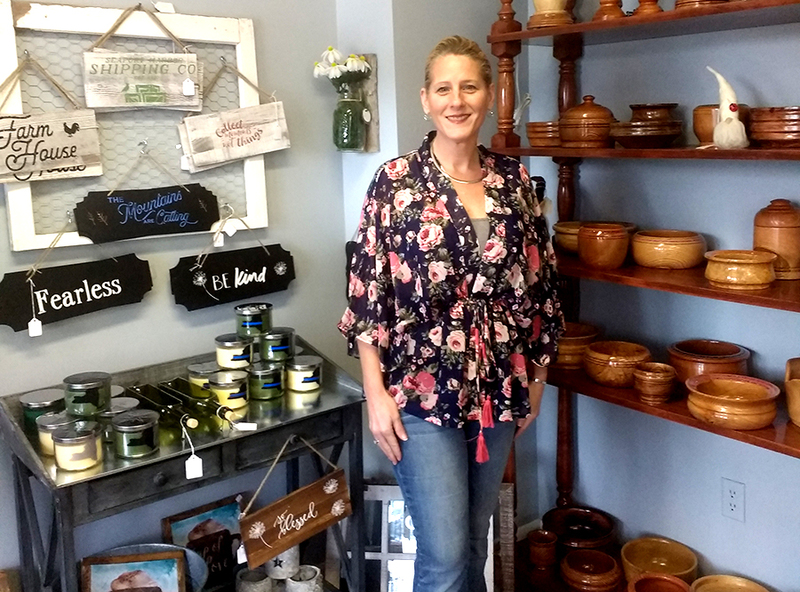 Tammy-Lynn Mullen brings goods from from area artisans and craftsmen into her shop, Crafted On The Park in Hudson Falls, so they can readily be sold to customers. Crafted On The Park is a new retail shop on Main Street enabling 40 different craft vendors from nearby communities to market quality crafts. The proprietor is Tammy-Lynn Mullen, who opened at 162 Main St. in December. But the business quickly outgrew that space and by early February had moved to the 1,500-square-foot space at 156 Main St. in Hudson Falls. The city of Glens Falls is accepting applications for facade improvements to businesses located in the downtown area. The $100,000 made available for the improvements are part of the $10 million the city received from the state for its Downtown Revitalization Initiative. The money will be awarded to businesses who meet the criteria of the grant. The deadline to submit applications is April 27 and instructions and applications are available at www.gfdri.org. The money will go toward interior and exterior upgrades, which can include window replacement, signs, updating sprinkler systems and other fire suppression systems, fixtures and lighting. The $25,000 limit can only represent 50 percent of the total cost. Mannix Marketing will be among those honored with a 2018 Ethics in Business Award (EBA), presented by Adirondack Samaritan Counseling Center in Hudson Falls. Mannix, along with Adirondack Technical Solutions in Argyle and Precise Painting and Wallcovering in Hudson Falls will be honored on April 12 at a dinner held at the Queensbury Hotel in Glens Falls. Established in 2012, the award acknowledges and recognizes businesses that do outstanding work and make their respective workplaces positive and rewarding places to spend time. Honorees also demonstrate ethical conduct, integrity and civic responsibility in dealing within and without their organizations. Elizabeth “Bea” Morin will be the new owner of Samantha’s Cafe in Glens Falls. Morin has worked at the restaurant in various capacities over the years. 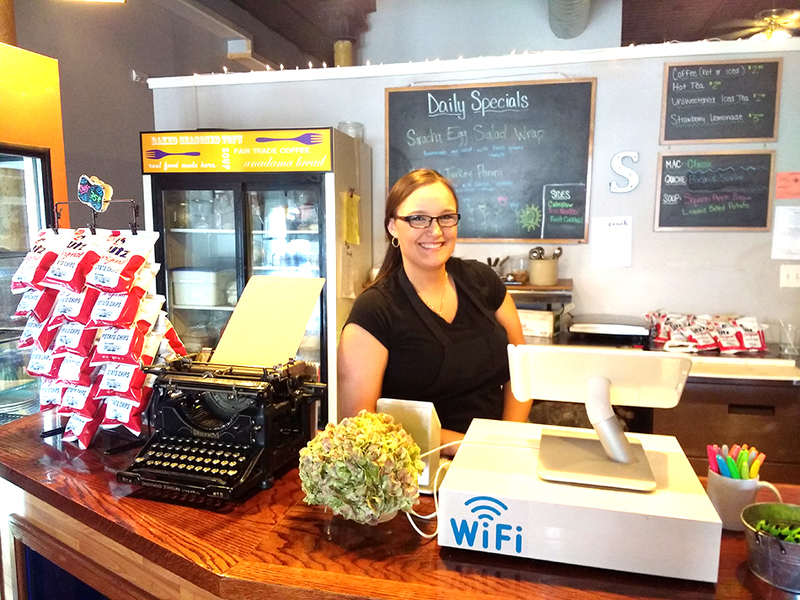 Samantha’s Café and catering company is about to welcome Elizabeth “Bea” Morin as its new owner. Morin is taking over the reins from Samantha’s previous owners, Jennifer Kraft and Elizabeth Wilcox, who have worked for the last seven years to expand the business.